There’s a simple rule for most modern bottled beers when it comes to ageing: don’t. It’s not worth it. Probably the vast majority of beers are designed to be drunk fresh, and all they will do if you keep them is deteriorate. However, a few beers actually need ageing before they’re in perfect condition, even if only for a couple of weeks to a month (in the case of lower-gravity bottle-conditioned ales) and some need even longer than that: nine months to two years before they’re drinkable. The stronger Guinness Foreign Extra Stout (7.5 per cent or so abv), when that was a naturally conditioned bottled beer, before 1948, required six weeks of conditioning after bottling but was then expected to remain in a perfectly drinkable state for at least a year. Lactic acid content increased as the beer aged in the bottle, but was balanced by the production of esters and other volatile components in the maturing beer, and the lactic acid was believed to add to the “fullness” of the flavour. Brewing chemists at Guinness found that yeast could survive in bottled FES for up to 35 years, suggesting that a beer could continue to mature for at least that long. Worthington White Shield, the 5.6 per cent abv bottle-conditioned India Pale Ale, is considered to take four weeks from bottling to come into prime condition, and to stay in condition for another nine months. After that, the beer is likely to be in a less than optimum state. Anecdotal evidence suggests that White Shield will come back into condition at 15 or 16 months old, albeit with an altered taste profile. It will not, though, survive much beyond about 24 months without showing signs of deterioration. It’s an interesting experiment to take a crate of newly-bottled lowish-gravity bottle-conditioned beers and taste them over three or four months: when I had a wedding stout made for me by the Pitfield brewery, which was bottled “live” in June at around 5 per cent abv, it hit perfection (and very fine it was) two months later, in August. After that it gradually went downhill (unlike, I’m happy to say, my marriage). My experience is that the effect of bottle ageing on beer varies considerably depending on (1) the alcoholic content of the beer (2) whether it is bottle-conditioned, that is, contains live yeast, or not (3) the conditions under which the bottle is kept and (4) the colour of the beer, with darker beers ageing better than lighter ones. I’ve drunk a 20-year-old pasteurised 8 per cent abv stout that was fine: I doubt the same would be true of a pale beer that old, even one that strong. Indeed, while the pale-coloured bottle-conditioned Vintage Ale from Fuller Smith and Turner of Chiswick, 8.5 per cent abv is best first drunk at around nine to 12 months old, it is likely to hit its peak at around two years old, and although it will continue to mature and change for several years after that, from five years old onwards the direction is likely to be down. Experiments suggest that the maturation takes place in “waves”, so that a beer which is in fine condition at, eg 30 months may have deteriorated at 36 months, be back on form at 42 months, deteriorated again at 48 months and so on. Stronger beers – those over 10 or 11 per cent abv – and particularly dark beers may need up to five years before becoming drinkable, with the “young” beer showing a distinct meaty or “umami” character that gradually disappears. Thomas Hardy Ale, 11.7 per cent abv, when brewed by Eldridge Pope was undrinkable at anything less than a year or 18 months: the O’Hanlon’s version was rather more welcoming when young. Other changes that take place in bottle-conditioned beers as they age are an increase in alcohol content, so that a beer bottled at 11 per cent abv might climb to 12 per cent after several years; a darkening or melanisation of pale beers; the development of “fruity” flavours that can range from cherries to plums; and the appearance of a vinous character. However, the very strongest beers look to have considerable potential life: I’m still enjoying drinking Whitbread Celebration Ale, 11 per cent abv when it was bottled, almost 20 years on. It was a version of Bass No 1, Ratcliff Ale, that was brewed and bottled in 1869 to celebrate the birth of a son, Harry Ratcliff, to one of the company’s partners, and a stash of Ratcliff Ale was discovered in cellars at Bass’s Burton upon Trent brewery in 2006. The beer was still sound and drinkable, despite being almost 140 years old, with a flavour, to me, between sherry and smoky Christmas pudding. Bass No 1 is also the beer inside bottles of King’s Ale, brewed in 1902, which, again, still prove drinkable today when opened. 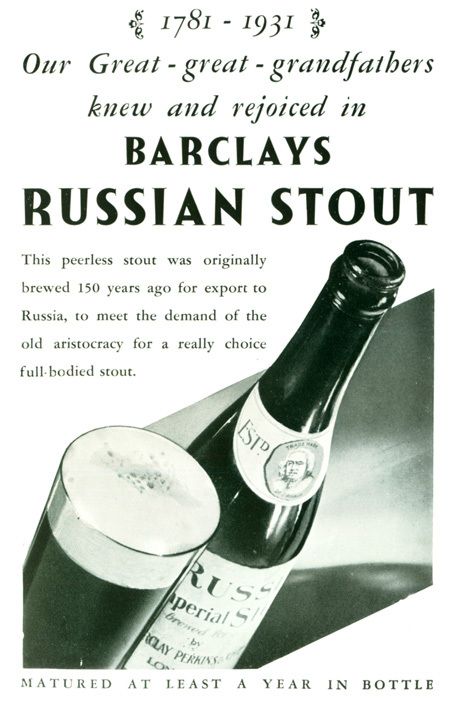 When brewers started expecting their bottled beers to be cellared for years, I don’t know: I’ve not found a reference to regularly produced “dated” bottle-conditioned beers before the London brewer Barclay Perkins began carrying the year of brewing on the label of its Imperial Russian Stout, from at least 1948. Imperial Russian Stout was matured, in the 1930s, anyway, for at least a year in the bottle before being put on sale. IRS ceased being produced in 1993, but bottles of the ’92 are still very good. 1) Don’t bother with anything less than 5 per cent abv, unless it’s (a) bottle-conditioned (b) preferably dark, and (c) only for a few months. 2) For a beer between 5 per cent and 7.5 per cent abv, don’t bother keeping it longer than 24 months, it’s likely to start deteriorating after than, if not before. 3) For a bottle-conditioned beer more than 7.5 but less than 10 per cent abv, several months may be needed before it is drinkable at all, and it should last in drinkable condition between five and 10 years. However, beware of the “waves” of drinkability, and if you find one bottle less drinkable than the last one you opened, you may find that if you wait a few months before opening the next, the beer comes back on form again. 4) For a beer more than 10 per cent abv, it may not be drinkable at all for at least a year, and it could be two years old before getting into any stride, but it is very likely to remain extremely satisfying for 10 years or more. 5) All the above depends on storing the bottles (a) upright (b) out of the light (c) at a constant temperature, or at least one that does not vary rapidly, and never higher than room temperature at worst (so yes to a wardrobe; no to alongside the boiler). We have 14 bottles of Avery Brewing’s Czar IMperial Stout, 8.5, that is 2015, and a couple that are the same, except 10.5 dated 2014. Aging nicely in a basement in a dark cupboard……….just drank half of one of the 2014’s , and it is getting wonderful! Quare #2: Any other “infected” brews? My questions (not an argument) rest on the case of Orval I set aside last year as well as the delightful 6.5% Ommegang Biere de Mars from Nov 2008 I discovered I owned last night. I own it no more. I’ve never aged Orval, and I’d be interested in others’ experiences, but I’d guess it would be like Guinness FES, another “brett” beer, when that was bottle-conditioned: you’re likely to see an increase in acidity but also in volatiles, and thus a greater complexity, at least for a while: but at 6.2 per cent abv I suspect Orval wouldn’t be suitable for ageing for very long. It sounds as im your Bière de Mars was on target, however, and from what very little I know about Brettanomyces yeasts they may well add to longevity: but I could be completely talking out of my arris here. I’d rather like this subject to be them of a Guild seminar. Adrian, Tim, are you there? I’ve done many experiments with the ageing of beer. Well, no. So many bottles have passed through my hands that I find strays months or even years later in the oddest of places. Sierra Nevada Celebration – I find it undrinkably shouty when young. Give it two years. Similarly, Torpedo needs about six months. Orval – six months to a year, but no more. Westvleterens – drink young, flavours mute over time. Not the accepted wisdom, I know. Gouden Carolous Christmas – sublime at 5 years. Light, effervescent dandelion & burdock. Brooklyn Chocolate Stout – Something went badly wrong. Earth, manure, stagnant ponds. In my cellar I have two 1974 Thomas Hardy’s. I’m still waiting for a suitably momentous occasion to open them. I think I might by a lottery ticket this week. I had a distinctly underwhelming experience with a 2-3 year old Brooklyn Black Chocolate, too. I haven’t had it fresh as a ‘control’, but was hoping it’d have lasted well, given its strength and darkness — my comparison was to a much fresher stout of similar strength, and the Brooklyn was just a massive disappointment. At the time I wasn’t quite sure which of many factors to attribute my lack of enthusiasm to, so it’s oddly comforting to find someone else having a bad run-in with an ageing sample of same. I just happen to have a stout I based on an 1883 Guinness grist, infected with a good bit of brett C. It’s been in the bottle for a few months now and tastes great, but I can’t wait for a year or two from now! Fortunately, the unopened case of Orval sits in a 1964 bungalow’s cold room floor on concrete five feet below the Earth’s surface. I bought it before Christmas and, given shipping times and Ontario’s mad wholesaling processes, was likely a September bulk buy. The plan is to have a few guys over on warm spring Saturday and drain the thing in one go. All sounds right on track. Good point from Jeff Pickthall. I’ve found that Westvleterens don’t age that well long term and they are very prone to the ‘one month good one month’ bad syndrome. From Belgium try Gouden Carolus, Het Kappitel Prior or anything from De Dolle. Thomas Hardy’s Ale is amazing. I’ve drunk a large number of them and the bottles from 1968 to about 1990 never let me down. Get your hands on the Royal Hardy’s Ale from 1983, a truly superb ale. Went a bit hit and miss in the 1990s, probably cost cutting with the recipe. I’ve got quite a few of the Bass corkers and was surrised to find out how well the 1902 King’s Ale had lasted. I had a 75cl Chimay Grande Reserve (I think there’s some tautology in there) at 10 years old. A definite disappointment: hadn’t held up at all. Orval – Fresh to a year takes on a wondrous evolution. After a year La Gout d’Orval takes over, though still enjoyable. North Coast Old Stock – Nice fresh but nothing special. A year does wonders. Lambics – I recall reading a quote from a lambic brewer on fruit lambics “In the the lambic always wins.” When to drink them is a matter of personal preference. I have a bottle of Cantillon Geuze that says it will keep for up to 30 years. I hope to push that until stricken by a moment of weakness. De Dolle – Most age splendidly, but take the brewer’s advice and drink that Arabier as soon as you can. *In the END the lambic always wins. From everything I’ve gathered, beers with live brettanomyces in the bottle are the best candidates or aging, except maybe for very strong stock ales. Brett can keep working for years, which is a big part of what takes so long to make a good old lambic. I know that some people swear by Orval several years out. I’ve had an 18 year-old bottle of Elyenbosch Gueuze that was still quite good, if almost flat at that point. I think a lot of it has to do with the oxygen scavenging activity of the yeast in the bottle. I’ve found that cardboard and excessive sherry notes have been the main offenders in bad aged bottles. Add some brett to the mix, and oxidation is hard to come by. It’s a very interesting area, and I find it hard to make safe predictions given the variety of beers out there and the variations in aging conditions. Bottle-conditioned beers definitely are the best to age. Anything well-filtered or pasteurised in my experience will start to go after a few months even when quite strong but not always, e.g., a 7 year old Carnegie Porter tasted great that I got in New York recently (Whole Foods). Starting to go can mean light oxidation – damp paper or sherry tastes – that wouldn’t bother a lot of people, but I find I am sensitive to it. Old beer that isn’t old in a good way just has a typical taste I find off-putting. But bottle-conditioned ones can do great in the cellar. I had one beer at only 5% ABV, a rye beer from Quebec, that was kept at room temperature including some fairly warm days, for almost two years and it was as good at the end as at the beginning. It had a strong Belgian-type yeast, which was part of it I think. Strongly hopped U.S. beers often benefit from long aging. A two year old Tally Ho surprised me by its fresh, malty taste. Some porters/stouts tend to acquire a strong Worcestershire sauce-like taste after a while, not brett but a spicy leathery brown sauce-like taste, not sure what that is. I like it when not too pronounced. Really I can only say if an aged beer is unfiltered and kept for a time relatively cool, it is probably fine. More than that you are down to particular conditions and circumstances that don’t recur and so the experience is hard to predict. Martin on the whole I agree although I think you do mis the subjective nature of cellaring beer. I know of fellow beer judges who cant stand oxidation of any sort, while I rather enjoy certain oxidative characters in certain beers. For someone who abhors oxidation the optimum aging period will be very different to mine. I think there is a large element of taste involved. I very much enjoyed my 79 Hardy’s, however many would regard it undrinkable I suspect. I completely agree about Chimay – I don’t think it’s intended to be aged very long. I’ve had year-old Orval in Ghent, and didn’t honestly think it had improved much at all – since you pay a premium for it, I have not repeated the experience, so maybe I was unlucky. The Beer Circus in Brussels keeps 12 and 15 year old Lambics and they are superb, becoming wine-like, with much reduced acidity. On the other hand I had a 10 year old Drei Fontainen in a bar in Delft a couple of years ago which hadn’t even started to soften. Martyn has had better luck with Whitbread’s Celebration than I have – I opened my bottle about a year ago, and it was far too oxidised for my taste. Tasted like stale sherry and not in a good way. Lastly – what do you think I should do? I have a bottle of Eldridge Pope Coronation Brew, brewed in May 1937, given to my great-grandfather, an Eldridge Pope tenant all his working life. I was given it by my grandfather. There is no indication of how strong it is, and it’s obviously a fairly pale beer. The cork is covered with a wax seal. I have wondered for years whether I should open it or not – what do you think? Once more, a very interesting topic! I have bottled Clout Stout (10.6% Russian Imperial Stout) and are aging 10 bottles to see how they vary over the next 10 years. What is best aging temperature? I’m with most of you that a big part of cellaring is subjective; what you like and don;t like in a beer. For instance, someone mentioned cellaring Sierra Nevada’s Torpedo. I like IPAs, so I wouldn;t intentionally cellar it. However, Victory’s Wild Devil, (the Hop Devil base bottled with Brett) is fascinating to try over the course of a year or so. At first, the hoppy character of the IPA is dominant, but over time, the hops fade out and the funky, barnyard character of the Brett becomes more and more pronounced. In general, I think that Imperial Stouts are the ones to cellar and wait for. (yes, sours/ geuzes / lambics as well) I have a bottle of ’09 Portsmouth Brewing Kate the Great, a ’10 Dark Lord, (will be getting the ’11 😀 ) and a few other bottles a couple years old sitting and waiting for an appropriate time for opening. A key factor you overlooked is cellar temperature and temperature fluctuations. Ideally, you want to cellar your beer in the same conditions you would cellar wine – about 50-55 degrees Fahrenheit, 50-60% humidity, and constant year-round conditions. Cooler conditions are possible (e.g., inside a refrigerator), but the beer doesn’t age as quickly. High humidity might rust the bottle cap. Temperature fluctuations increase the rate of oxidation. Some beers designed to be aged for long periods of time have their necks dipped in sealing wax to prevent these problems. My rule of thumb for aging beer is: minimum ABV 6%, minimum SRM 10. Weaker beers, especially light-colored beers just get nasty, soapy, cardboardy flavors due to age. Dark, strong beers like Imperial stout pick up yummy “Christmas pudding” dark fruit and sherry notes. Let me add Duvel to the list of beers that age well, at least for many months. Here is where homebrewing gives a real opportunity for experimenting. I brewed a strong (9-1/2%) stout last year from a recipe of the 1870’s from Kristen England via Ron Pattinson and it is already showing wonderful changes in the bottle. I’ve also bottled bottled several 19th century 6-7% pale ales with two different strains of Brett. c., one from WhiteLabs and one from Wyeast (I preferred the WhiteLabs). Just last evening I opened my penultimate bottle (of 72) of 1.070 IPA from 2003. Sadly, it showed signs of age, but I will save the last one for next year hoping it will come back into form. I’ve also got into the whole ageing thing after reading Pete Brown’s latest. Looks like thumbs up for my late 60s Bass No1, and thumbs down for my 1962 Whitbread The Queen’s Ale. (The latter might not be strong enough – difficult to tell really as absolutely no info anywhere on this one, aside from the fact that the brew was “initiated” by HRH on a factory visit to Whitbread.) Both recent eBay purchases. Top one, Martyn! I’ll drink to the syncronicity……. hey guys, i found the following while moving home, all unopened.. If a bottle is corked is the advice to lay it on its side as with wine, and then stand it up a few days before opening? Can anyone let me know their opinions? I have a bottle of Boon’s Oude Geuze Mariage Parfait, vintage 2004, with a print “best before” date of May 16, 2028. As lambics seem to go, it’s quite strong at 8% abv. De Moelen claim on the label for “Heaven & Hell” that “This beer will be good for 25 years if kept Cool and Dark.” I doubt I’ll keep either around long enough to find out, but perhaps I could at least hold onto the gueuze for another three years. I have 6 bottles of Whitbread Celebration Ale, a forgotten present from nearly 20 years ago, Still in all the original packing, and kept under our house. I think the time has come to sample said beer, and would appreciate some tips on how to pour & serve. Can the sediment be drunk as in wheat beers etc, or is it best left in the bottle. The biggest difficulty is getting the cork – which is under a red wax seal – out of the bottle without dropping bits of wax into the beer. I wouldn’t recommend drinking the sediment – pour it slowly, and leave a small amount behind with the lees in. You should find the beer is still perfectly drinkable, although I’d say, from the bottle I drank last month, it’s slowly on its way out. Time then to stand a bottle up for a few days, open & give it a try. I’ve got two bottles of Adnam’s Tally Ho that I bottled (in Newquay Steam Beer flip tops) from a cask in… 1991. I drank the other dozen or so during the following months and it certainly benefited from the brief ageing. I kept meaning to open the last two but never really got round to it. I think your post has inspired me to bite the bullet soon. Here’s hoping for a miracle! On a slightly different note, your comment about most beers being designed to be drunk immediately echoed an argument I had with a former head brewer at Jennings who insisted his Sneck Lifter (5.5%) should be drunk fresh. About six months later he tasted a pint from a firkin that had been ‘overlooked’ and he was surprised at the richness of flavour that had developed. I think though, that the alcohol content of most beers doesn’t allow the preservative qualities needed for long-term ageing. Well, the 20-year experiment is over. On opening a bottle of Tally Ho there was the briefest of hisses, which was slightly encouraging. Gently pouring a small amount into a wine glass there was no noticeable trace of carbonation, but no head formation, but as this was bottled from a settled cask I suppose that was to be expected. The beer was almost crystal clear and dark brown in colour. Overwhelming aroma of burn caramel, with no discernible hop, but no vinegars either. Taste, again, overwhelming burnt caramel, esters and no hop. Almost completely flat and quite vinous. Overall, rather like a bottle of expectorant I have in the bathroom cupboard. Shame, but while chemically well preserved, the long period in store hasn’t done anything to improve the beer and I’m going to have to wash the taste away with a Sam Smith’s Oatmeal Stout. Ah well – it’s always interesting to do these experiments, even if they don’t always work. Have just opened a Whitbread Celebration. Almost no carbonation (as expected) and a heavy aroma of Bovril. But underneath that there are really long, complex flavours. Plenty of dark coffee and fruit (stewed apples, perhaps). Really fantastic. I’m having a twenty three & 1/2 year old bottle of san miguel dark beer .. kept in a hot garage ..
My son is 18 soon and has 6 bottles of Thomas Hardy Vintage 1994 Ale from Eldridge Pope. He wants to sell them. Are they worth much do you think ? I’m curious about color with regards to beer aging. Does darkness per se help the beer age better by lessening its photo-sensitivity, or does the acidity present in darker grists help the beer age by lowering its pH? Now there, I’m afraid, you need an expert, which I am most certainly not. Just came upon this thread again and noticed my comment at the top of the page, now nearly 3 bloody years ago..I opened my 1997 K&B Christmas Ale at Xmas 2011, and, sadly, it was past it. Flat. Dead. Just a faint whiff, a hint of the great beer from the brewery I loved and miss so much. So the following Xmas I opened one of the Millennium Ales with little hope, expecting to have to pour it down the sink. But no, the cap came off with a pfzzzzz, a little whisp of beery ectoplasm escaped, and the aroma hit me as I poured it out. I can’t do the tasting notes stuff but it was wonderful, and I felt I was shaking hands again with a long dead mate. Still have a couple of bottles left: I wonder if they’ll be as good. What if cellar temperature have some fluctuations and in summer goes up to 27°C? Then you’re flucked. No, seriously, high temperatures will speed up maturation, so you can just expect everything to be quicker.